Between June 2008 and January 2014, the Unemployment Insurance (UI) programme in the US was expanded significantly as unemployed workers became eligible to receive up to 99 weeks of UI payments, compared to the usual 26 weeks available before the Great Recession. Starting in November 2008, generosity also began to vary substantially across states. This unprecedented UI expansion provides a unique opportunity to study the aggregate employment effects of UI benefit duration. A large body of research has studied the effect of UI duration on the labour supply and job search behaviour of individuals, including during the Great Recession (e.g. Rothstein 2011, Farber and Valetta 2015). However, the macro effect of the policy may differ from the micro effects both by stimulating aggregate demand (Summers 2010, CBO 2012), or by increasing reservation wages and reducing vacancies (Mitman and Rabinovitch 2014). In a recent paper, we examine the effect of UI duration on aggregate employment during the Great Recession using state-level expansions and contractions in UI generosity (Boone et al. 2016). We provide transparent evidence on employment dynamics around sharp and durable changes in UI benefits across counties that were otherwise very similar, and we provide a reconciliation of the differences in findings across existing papers. Overall, we find a small, positive and statistically insignificant employment impact of expanding unemployment insurance by 73 weeks. Unfortunately, the nature of the UI extensions during the Great Recession makes studying this question very difficult. In order to target more generous benefits to those areas in greatest need, the benefit extension programmes were structured to grant longer benefit lengths to states with higher unemployment rates. This targeting makes it difficult to determine the impact of UI on employment by simply comparing states with more generous benefits to those with less. If we observe a negative relationship between UI duration and employment, is this because more generous unemployment insurance leads to lower employment? Or is it simply because those states with weaker labour markets were targeted with additional benefits? As we show in our paper, consistent with policy endogeneity, counties that ended up with more generous benefit payments were ones that exhibited lower employment growth in the four years prior to the 2008 benefit expansion. To avoid this reverse causality problem, we use a border discontinuity design, where we compare 1,161 county pairs that straddle the border between two states, such as Allegany County, Maryland, and Bedford County, Pennsylvania. Within each pair, counties share a similar geography and economic environment, but may have access to different lengths of benefits, largely due to the economic situations in the rest of the state. By comparing neighbouring areas we are much better able to account for possible policy endogeneity. For this reason, the border discontinuity design has become popular, and has been applied to studying various policies, including the minimum wage (e.g. Dube et al. 2010). To purge remaining endogeneity, we also present results for the subset of county pairs that exhibited similar employment trends during the period prior to treatment. We then compare changes in county employment to changes in the maximum length of benefits within each pair over the course of the Great Recession. In addition to using all policy variations over this period, we also separately focused on two major policy changes: one that expanded benefits in November 2008, and one that eliminated all extended benefits at the end of 2013. Both of these events led to differential changes across state boundaries. 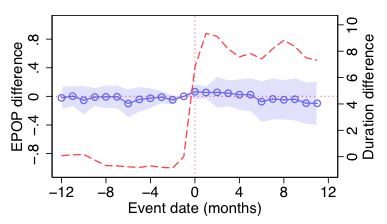 The advantage of these specific event studies is that they further deal with policy endogeneity, as these changes were prompted by shifts in national policy rather than fluctuations in individual state economic performance. Our baseline results suggest that extending benefits by 73 weeks increased the employment-to-population (EPOP) ratio by 0.2%, a negligible amount that is not statistically significant. While our employment estimates are not statistically distinguishable from zero, they do rule out moderate-sized negative employment effects of the UI extensions on EPOP of 0.5% or more. To put this in perspective, the overall drop in EPOP during the Great Recession in our sample was 3%. These conclusions are reinforced when evaluating dynamic evidence from our first-difference distributed lag specifications. For the full sample using our preferred set of controls, we find that employment levels remained essentially unchanged over a 36-month window that includes 24 months after treatment. These results are displayed in Figure 1, which shows no evidence of a negative employment response to an increase in UI benefits (at date 0). Nor do we see evidence of ‘anticipation effects’ prior to the introduction of differential benefits. Event studies for the 2008 introduction and 2014 expiration also show qualitatively similar results. These findings are summarised in Figure 2, which plots the pooled employment response to national level policy changes, namely the 2008 expansion and the 2014 expiration of the extended UI benefits. When the policy change occurs at event date 0, there is a clear increase of around 10 weeks of additional benefits in one side of the border as compared to the other, and this change is quite persistent. Despite the sharp increase in UI benefits, employment appears to remain largely unchanged over the following 12 months. In addition to estimating the employment impact of UI expansion, we also interpret our results in light of a standard labour supply effect and a simple aggregate demand effect. We consider the standard labour supply effects from the literature, especially the estimates coming from the Great Recession. Our macro effects are generally more positive than suggested by the micro labour supply effects. We interpret the gap between the two as due to a Keynesian aggregate demand effect. Our macro employment estimates are consistent with a range of fiscal multipliers centred around 1 when we consider the typical range of micro effects of UI estimated during the Great Recession. The results in our paper contrast with two recent papers by Hagedorn et al. (2016), and Hagedorn et al. (2015). Like us, they employ a strategy comparing county pairs which straddle state borders, but they find a substantial negative effect of UI on employment. In our paper, we provide a detailed accounting of why our result is different from theirs. We focus on the two most important differences here. First, we use employment data from the Quarterly Census of Employment and Wages (QCEW), instead of imputed unemployment data from the Local Area Unemployment Statistics (LAUS) produced by the Bureau of Labor Statistics. The QCEW data is an administrative census on employment capturing 98% of jobs. In contrast, county level employment data from LAUS is imputed in part using state-level data, reintroducing state level endogeneity that the county border pair method is designed to purge. In some cases, the use of revised LAUS data also sharply changes the findings (e.g. in Hagedorn et al. 2016). Second, we eschew the Hagedorn et al. (2015) approach to dealing with expectations by quasi-forward differencing the dependent variable, as this filtering can produce misleading results. 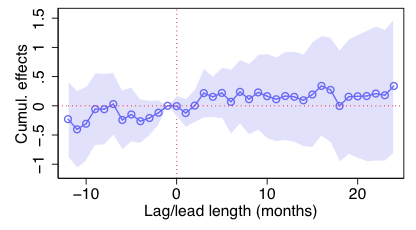 Instead, we show 12 leads at the monthly level as transparent evidence that the policy anticipation concerns that Hagedorn et al. (2015) are worried about do not play a noticeable role in our estimates. An additional paper that finds different results from ours is the case study of Missouri by Johnston and Mas (2015). They find a macro employment effect that is substantially more negative than ours, and similar in size to their estimated micro effects. The most important difference between our papers is that their macro estimate is from one particular event, while ours aggregates across many different benefit extensions and reductions and hence constitutes a more representative estimate. Our findings are quite similar to those from two recent papers that have estimated the macro effect by exploiting variations in state-level UI extensions coming from measurement error in the total unemployment rate (Coglianese 2015, and Chodorow-Reich and Karabarbounis 2016). Chodorow-Reich and Karabarbounis (2016) specifically use revisions to the official unemployment rate to construct plausibly exogenous short term variation in UI durations. The methodologies and source of policy variation in these papers are quite different from our own – for example, we are able to estimate the impact of more durable changes in policies than possible using the measurement error approach. However, the very different types of variation leveraged across our two sets of papers makes them complementary. Overall the findings in all three papers suggest that the employment impact of the sizeable UI extensions during the Great Recession was likely modest. At worst, they led to a small reduction in aggregate employment, and at best they slightly boosted employment in the local economy. Our findings suggest that the substantial insurance value of the UI extensions during the Great Recession was not offset in any meaningful way by a cost from weaker job growth. This is a useful lesson for policymakers to keep in mind when designing optimal countercyclical policies. Boone, C, A Dube, L Goodman, and E Kaplan (2016), "Unemployment Insurance Generosity and Aggregate Employment", IZA Discussion Paper. Chodorow-Reich, G, and L Karabarbounis (2016), “The Limited Macroeconomic Effects of Unemployment Benefit Extensions”, NBER Working Paper 22163. Coglianese, J (2015), “Do Unemployment Insurance Extensions Reduce Employment?”, mimeo, Harvard University. Congressional Budget Office (2012), “Unemployment Insurance in the Wake of the Recent Recession,” Technical report. Dube, A, T W Lester, and M Reich (2010), “Minimum wage effects across state borders: Estimates using contiguous counties”, Review of Economics and Statistics, 92 (4), 945–964. Farber, H S, and R G Valletta (2015), “Do extended unemployment benefits lengthen unemployment spells? Evidence from recent cycles in the US labor market”, Journal of Human Resources, 50 (4), 873–909. Hagedorn, M, F Karahan, I Manovskii, and K Mitman (2015), “Unemployment Benefits and Unemployment in the Great Recession: The Role of Macro Effects”. Hagedorn, M, I Manovskii, and K Mitman (2016), “Interpreting Recent Quasi-Experimental Evidence on the Effects of Unemployment Benefit Extensions”, NBER Working Paper 22280. Johnston, A, and A Mas (2015), “Potential Unemployment Insurance Duration and Labor Supply: The Individual and Market-Level Response to a Benefit Cut”, Unpublished manuscript, Princeton University. Mitman, K, and S Rabinovich (2014), “Do Unemployment Benefit Extensions Explain the Emergence of Jobless Recoveries?”, Unpublished manuscript. Rothstein, J (2011), “Unemployment insurance and job search in the Great Recession”, Brookings Papers on Economic Activity, 143–214. Summers, L H (2010) “The Economic Case for Extending Unemployment Insurance,” The White House Blog, 14 July.